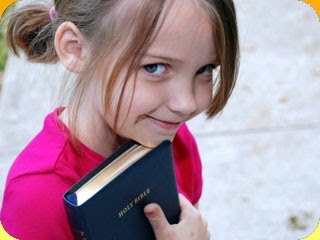 Yesterday, I wrote about the opportunity we have to help our kids memorize Scripture. Today, let's talk about choosing verses. On a friend's recommendation, I tried Truth & Grace memory books. They not only give you a list of verses, but also divide them up according to age, starting at 2-3 years old. I have used those books as a jumping off point, tweaking them according to my kids and what I want them to learn (like right now we're talking about respect alot). If you'd like to get started, but need a little direction, here are some verses you can start with. They are written out so you can see the word choices used, even for small children. They are also in the order that we're learning them. Genesis 1:1 "In the beginning, God created the heavens and the earth." Matthew 22:37 "Jesus said, 'You shall love the Lord your God with all your heart, with all your soul, and with all your mind." Matthew 22:39 "You shall love your neighbor as yourself." John 14:6 "Jesus said, 'I am the Way, the Truth, and the Life. No one comes to the Father except through Me." Luke 19:10 "For the Son of Man (Jesus) has come to seek and to save that which was lost." Ephesians 6:1 "Children, obey your parents in the Lord, for this is right." We also added a definition of obedience to learn: "Obedience is doing what someone says, right away, without being reminded." John 1:1 "In the beginning was the Word (Jesus), and the Word was with God, and the Word was God." Matthew 6:9-13 (The Lord's Prayer) "Our Father in Heaven, Hallowed be your name. Your kingdom come. Your will be done, on earth as it is in Heaven. Give us this day our daily bread. And forgive us our debts, as we forgive our debtors. Do not lead us into temptation, but deliver us from the evil one. For yours is the kingdom and the power and the glory forever. Amen." Psalm 145:3 "Great is the Lord, and greatly to be praised; And His greatness is unsearchable." Psalm 145:8-9 "The Lord is gracious and full of compassion, slow in anger and great in mercy. The Lord is good to all, and His tender mercies are over all His works." Romans 5:8 "But God demonstrates His own love toward us in that while we were still sinners, Christ died for us." Romans 6:23 "For the wages of sin is death, but the gift of God is eternal life in Christ Jesus our Lord." Romans 10:9 "If you confess with your mouth the Lord Jesus and believe in your heart that God has raised Him from the dead, you will be saved." Ephesians 2:8 "For by grace you have been saved through faith, and it is not of yourselves; it is the gift of God." John 6:35 "And Jesus said to them, 'I am the bread of life. He who comes to Me shall never hunger, and he who believes in Me shall never thirst." John 1:29 "The next day, John saw Jesus coming toward him and said, 'Behold! The Lamb of God who takes away the sin of the world!" John 11:25-26 "Jesus said to her, 'I am the resurrection and the life. He who believes in Me, though he may die, he shall live. And whoever lives and believes in Me shall never die. Do you believe this?" Philippians 2:14 "Do everything without complaining and arguing." The 10 Commandments: 1) Do not have any other gods except for me. 2) Do not make any idols for yourself. 3) Do not misuse the name of God. 4) Set the Sabbath day apart as a special day. 5) Honor your father and mother. 6) Do not murder. 7) When you are married, love your wife only--no one else's. 8) Do not steal. 9) Do not lie. 10) Do not want what others have.